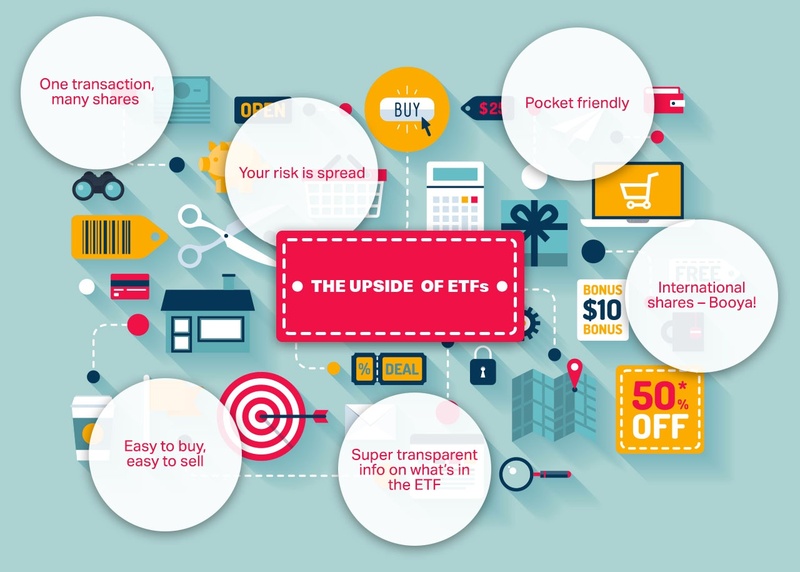 Intellidex and EasyEquities teamed up to run a series of articles explaining how retail investors can use ETFs as part of their broader investment strategies. The ultimate objective for any investor is to have an optimised portfolio that balances risk and returns to fit the investors’ needs in the most rational way. ETFs can be an excellent help in that objective. In this note we consider how to use ETFs in a “core-satellite” approach to investing. This is a popular approach to asset management – at the core of your investment portfolios you have a low risk, low cost portfolio. Then you take on more risk with a more speculative “satellite” portfolio which you try and beat market returns. .
ETFs are a great way to invest in a diverse portfolio without going to the trouble of buying all the shares in a portfolio yourself. Portfolios low risk while providing good returns so are considered more “efficient” in that they balance risk and return better. The market return as a whole is generally called “beta”, a component of returns that can be contrasted with “alpha”. Beta comes from the market as a whole and usually reflects the macro performance of an economy. Alpha is the return that differs from the market and the return that stock pickers are chasing. They believe that they can pick stocks that will outperform the market, so they are trying to generate alpha. You often hear on news of fascinating price movements of commodities (such as gold, oil, platinum, or iron) or some other financial asset (such as a currency, Krugerrands, Reits, tech stocks or bitcoin). Usually these random price movements are influenced by geopolitics, the economy, the weather, some technological development or social trends. You may recall that the price of both iron ore and oil climbed to historical highs between 2009 and 2013 but then started falling. They have, though, been recovering since the beginning of 2016. Wouldn’t it have been nice to ride the wave of such a price increase? Of course it would, but the downside can be massive given the almost inevitable price fall afterwards. Using the core-satellite approach you can make tactical (short-to-medium term) changes to your portfolio and participate in such asset price movements. ETFs provide the easiest way to get the “core” of your portfolio. They are low cost and diversified. The “satellite” part of the portfolio can then be assembled through a normal stockbroking account or some specialised ETFs. The satellite portfolio can be used for tactical investments to take advantage of particular market views. 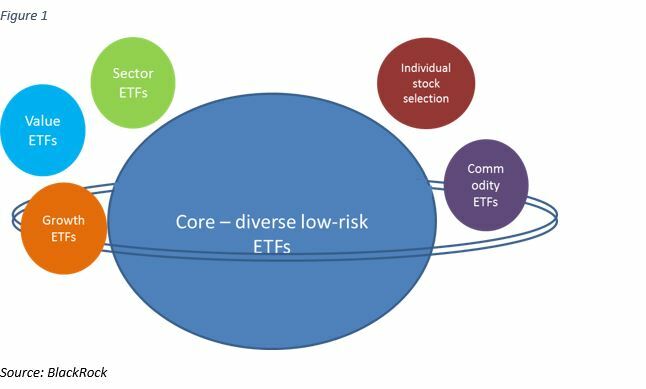 The core is made up of one or more ETFs that provide a diverse low-risk portfolio. This element can be shaped by the investor’s overall risk profile. The aim is to deliver a return in line with the market’s performance – the beta return. The second segment is made up of the satellite. These can be a portfolio of shares, derivatives or other instruments, or more specialised/concentrated ETF portfolios that are designed to deliver excess return (alpha). These carry higher risk and can incur higher fees. A self-invested stock portfolio usually carries higher transaction and custody costs. As a tactical investment, the satellite would be more actively traded, so investors would exit once the short-term opportunity has materialised. It’s important to be disciplined: if the opportunity does not materialise as predicted, close the position. You can use the satellite portfolio for a variety of strategies – depending on your outlook for various investment themes. Who can use the core-satellite portfolio strategy? When it comes to investing, the driving principle is the amount of risk that an investor is willing to take. Naturally, this strategy fits long-term investors, who are willing to take a tactical investment view using a small portion of their funds. This is usually anything between one and three years.